With blue skies and beautiful weather, now&apos;s the perfect time to take Tampa Bay on two wheels. 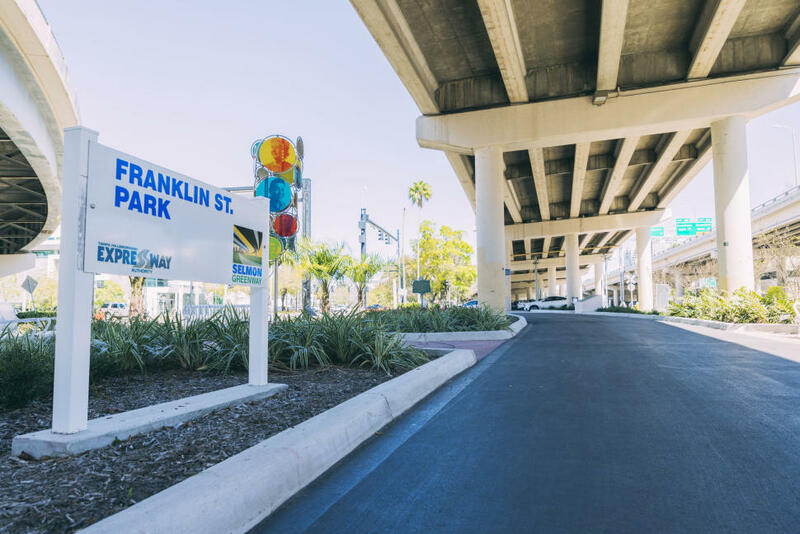 Biking has vast potential in the nation&apos;s third-largest state, and this connection between the Ybor City district and the north side of Tampa&apos;s downtown shows a Florida city building its most important bike routes first. 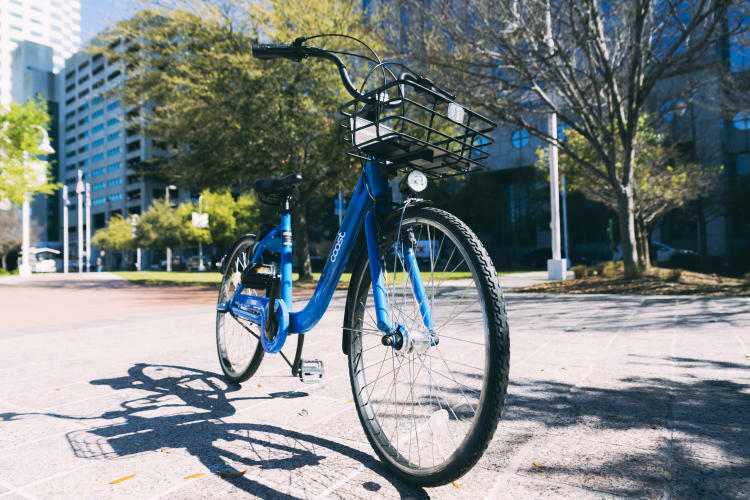 With year-round sunshine, more than 100 miles of bike lanes, and flat-to-gently sloping terrain, Tampa Bay is a natural place for pedal-ushing. Don&apos;t have your own bike? Don&apos;t worry. 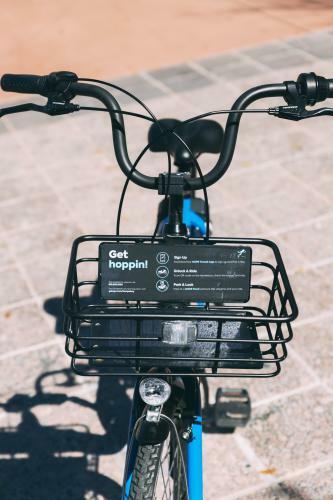 The Epicurean Hotel and Le Meridien Tampa both offer free bikes to their guests. 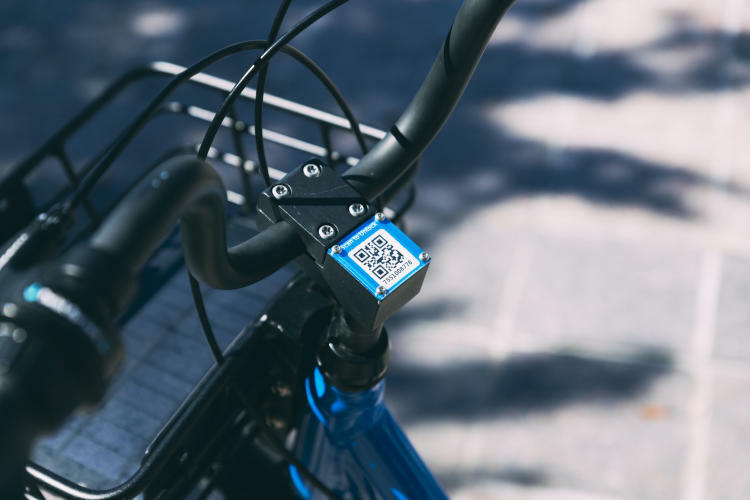 Or, with a smartphone and a credit card, you can rent one from Coast Bike Share and be riding in a few minutes. Just remember: Helmets are required for kids. You can find those along with rentals at City Bike Tampa across from the new bike lane on Cass Street. 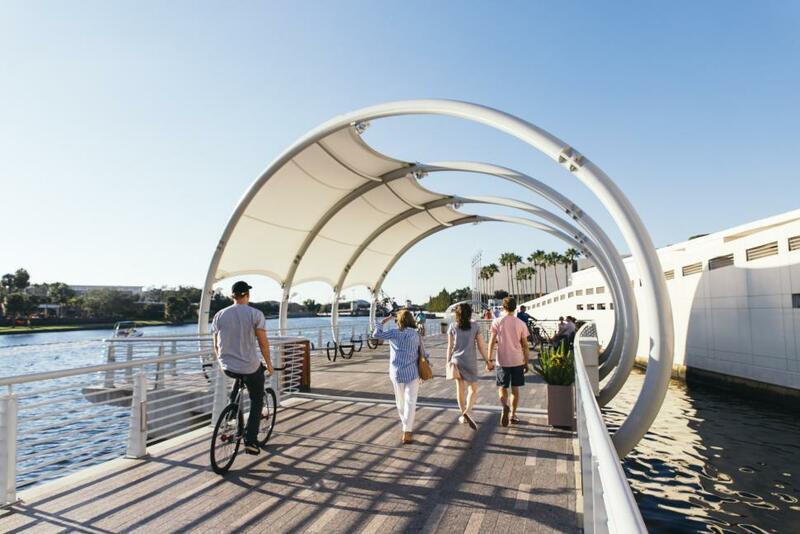 The Tampa Riverwalk runs for 2.4 miles (4 km) along the Hillsborough River and Garrison Channel, linking downtown’s favorite attractions like gems on a string. Take your time and hop from The Florida Aquarium to Tampa Bay History Center to the downtown waterfront to Curtis Hixon Waterfront Park to the Straz Center for the Performing Arts to Water Works Park and Ulele restaurant. 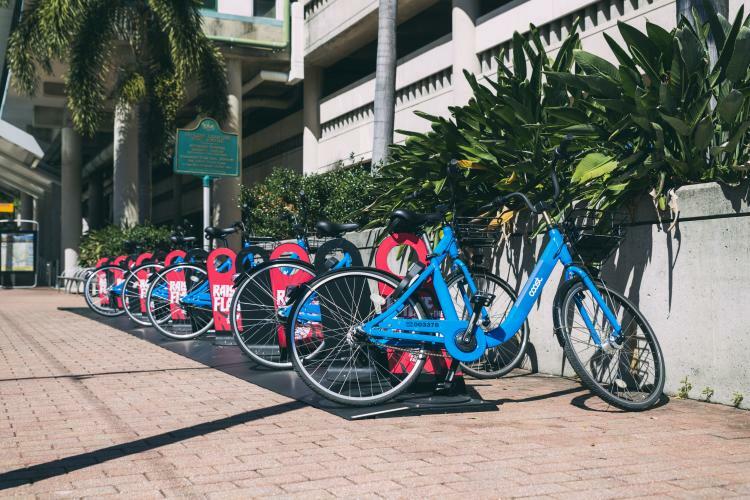 Coast Bike Share has rental stations spread all along the Riverwalk, with the biggest ones outside the Glazer Children&apos;s Museum and Tampa Convention Center. You&apos;ll find bike repair stations at the waterfront and just north of the Straz Center. Beware: Bikes are limited to 5 mph on the Riverwalk, which can be crowded with pedestrians at certain times of day. So take it slow. 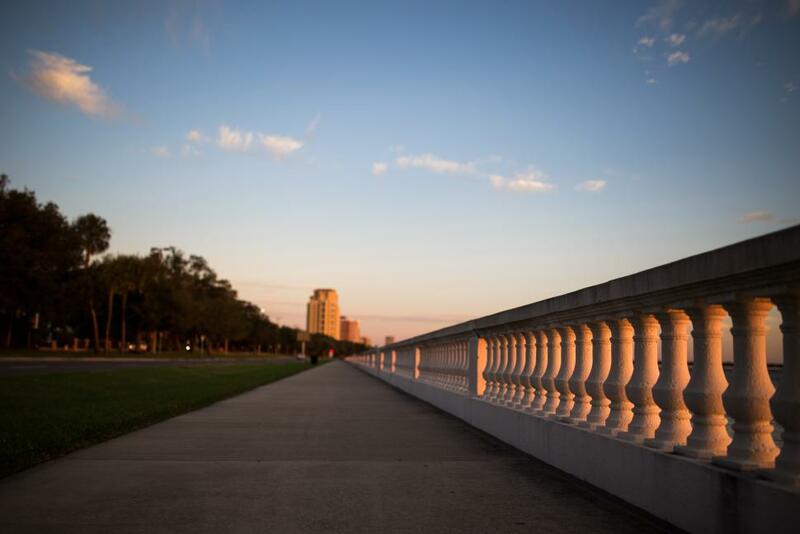 Downtown&apos;s original waterfront pedestrian course, at more than five miles long Bayshore ranks as the world&apos;s longest unbroken sidewalk. The curving path starts at Platt Street (the bridge links Bayshore with the Riverwalk) and runs to Gandy Boulevard, passing some of Tampa Bay&apos;s most dramatic scenery and most impressive real estate along the way. Keep one eye out for dolphins, diving pelicans and maybe the occasional manatee just over the balustrade. The path is very popular with walkers, joggers and other cyclists, so be courteous. You&apos;ll find an ad hoc single-track path worn into the grass just to the inside of the concrete path. You&apos;ll also find a striped bike lane on the northbound side of the road itself. Bayshore provides easy access to tony South Tampa neighborhoods such as Hyde Park (between Dakota and Howard avenues), home to leafy streets and high-end shopping at Hyde Park Village, as well as Palma Ceia (at Bay to Bay), home to neighborhood favorite Datz restaurant. The boulevard&apos;s median is an unofficial open-air art gallery inviting passers-by to stop and ponder the creations. Connecting to the Tampa Riverwalk at Brorein Avenue, this bike path twists and turns across downtown in the shadow of the elevated Selmon Expressway. The ultimate goal: historic Ybor City. The recent addition to downtown&apos;s bike network makes use of existing streets, sidewalks and parking lots to wend its way through town. It&apos;s a little more complicated than the Riverwalk or Bayshore, but keep an eye on the signs and you&apos;ll do fine. This part of town is on the verge of major changes thanks to Tampa Bay Lightning owner Jeff Vinik&apos;s planned $2 billion investment in the Channel District. Twin rewards are waiting at the end of the path: a view of An American Journey, a sprawling mural depicting the immigrant history of Ybor City, and Coppertail Brewing Co., among Tampa Bay&apos;s best craft breweries. 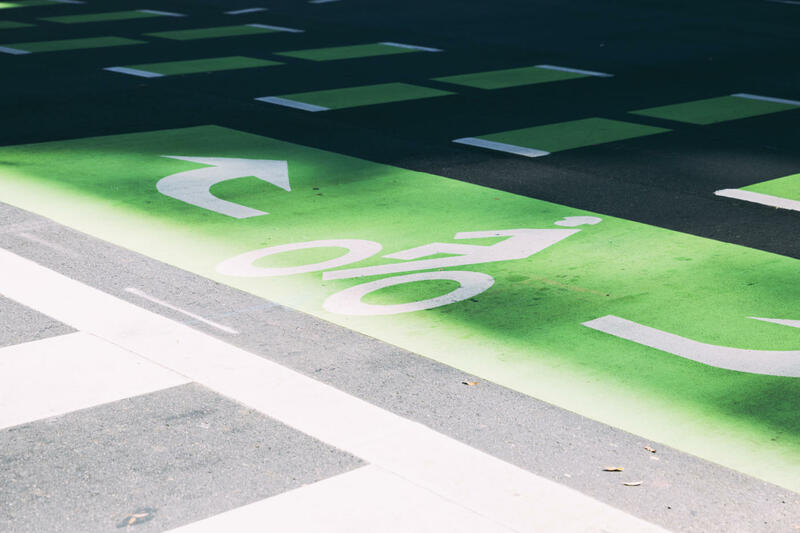 Over the past few years, city leaders have expanded opportunities for cyclists in downtown and the surrounding neighborhoods, largely by adding striped bike lanes wherever possible (Palm Avenue from Tampa Riverwalk to Ybor City). Additionally, every street repaving includes the addition of new bike lanes (Cass Street downtown, Platt Street in Hyde Park) or wider sidewalks that like bikes and walkers co-exist (21st and 22nd streets in Ybor City). Bike tours and meet-ups bring bike-enthusiasts together for regular rides. Flatwoods Park Trail: Located in the suburbs north of the University of South Florida, the sprawling park is popular with weekend riders looking for a few hours of fun and exercise. The seven-mile loop has a two-mile connection to the most popular entrance off Bruce B. Downs Boulevard (bring $2 to pay for parking). A gravel-topped levee connects Flatwoods with other parks farther south. Courtney Campbell Trail: This trail runs parallel to the Courtney Campbell Causeway, which links Tampa Bay with Clearwater. The 10.5-mile ride spends most of its time over the water, providing great views of the bay, boats and wildlife that make this region special. On the Tampa Bay end, you can connect with several smaller parks. Upper Tampa Bay Trail: A converted railroad bed, this trail winds through suburban Citrus Park and rural landscape filled with grazing cows, with plenty of access to water and bathrooms. Recent extensions have linked this trail with the 42-mile Suncoast Trail in the suburban community of Lutz. Suncoast Trail: Opened in 2001, this trail parallels the Suncoast Parkway, a tollroad that connects with the Veterans Expressway in suburban Northdale and runs north across Pasco and Hernando counties nearly to Homosassa. The trail takes you from the suburbs through some of the most remote country in the area. Be warned: Water, restrooms and shade are limited. Also, the trail does not loop, so you&apos;ll have to ride back or arrange a pick-up at the end. This is for the serious cyclist. You can also pedal your way around Tampa Bay way off the beaten bike path -- and on the water. 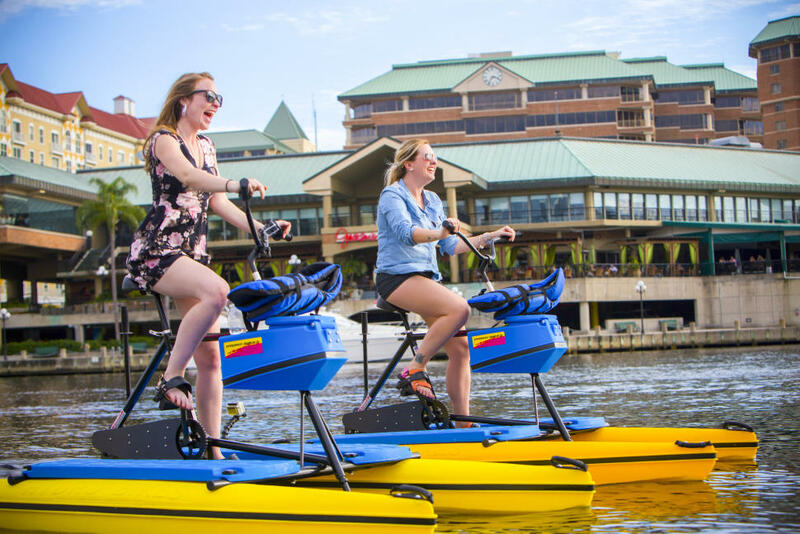 Located on the waterfront by the Tampa Convention Center, Tampa Bay Water Bikes rents pedal-powered, pontooned vehicles that give you a chance to see downtown from a whole new angle. The crafts function just like a bike, but have paddles where the front tire and back tire ought to be. Take one for a spin.